It’s a little odd to put “The Legend is Back” on the poster for a movie, knowing it refers to a veteran actor, instead of the character the actor is playing. 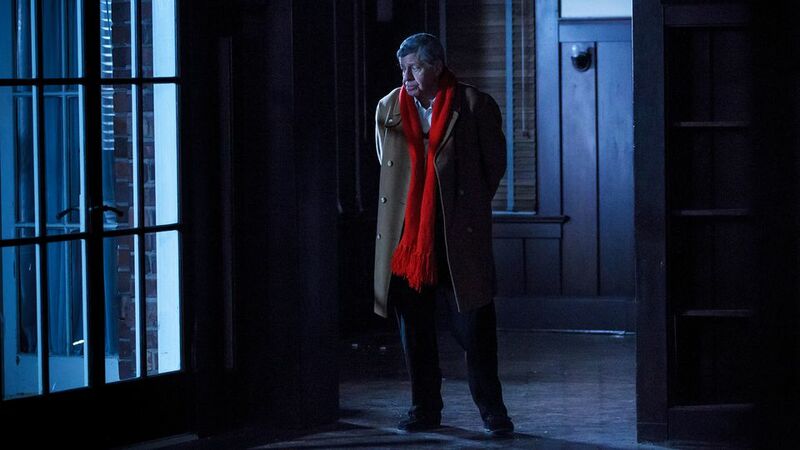 It’s also prefaced by “Jerry Lewis is Max Rose”, so the implication is to watch “Jerry Lewis“, rather than watch the actor disappear into a role. Could a star this big, who’s on-screen presence has been absent for so long really disappear into a role thought? There’s an expectation then that “this is something” and, in a way, it kind of is, seeing as how this is the first live-action American movie Lewis has starred in since 1995’s “Funny Bones”. No, we’re not counting the crime film “The Trust”, which went straight to VOD this past Spring, where Lewis played Nicolas Cage’s father (Lewis didn’t even appear in the movie’s trailer). Neither of those films were headlined by Lewis, which finds “Max Rose” surrounded by a good deal of curiosity and anticipation, leading into its limited theatrical release. Lewis plays Max Rose – a sad, regretful and depressed old man, newly widowed from Eva (Claire Bloom) his sweet wife of 65 years. He’s a former jazz pianist, who now looks back on his past as a series of failures. Yes, he’s grieving, but it feels like Max Rose has been a difficult man to get along with prior to his devastating loss. Max gets along just fine with his helpful granddaughter, Annie (an appealing Kathy Bishé) yet chooses to treat his well-meaning son, Chris (Kevin Pollack) with woeful indifference. Now along in the house they used to share together, Max rummages through his wife’s belongings, such as her countless sketchbooks, he comes across an ornate compact of hers that has a loving message dated 11-05-59, lovingly inscribed by a man named Ben. This revelation and the uncertainty surrounding it rocks Max’s world as he begins to wonder if his marriage was a lie all this time and sends him reeling his way into a nursing home. That doesn’t stop Max from pursuing this new mystery from his past that has developed into an obsession for the fragile man, who will soon find out if the truth he seeks will offer satisfying answers or confound him even further. It’s certainly not intentional on the part of writer/producer/director Daniel Noah, but the premise of “Max Rose” feels very similar to last year’s Oscar-nominated film “45 Years”. In that film, writer/director Andrew Haigh, focused on a married couple who are about to celebrate their 45th anniversary together when the wife discovers receives shattering news that could cause her to second-guess her relationship with her husband. “Max Rose” isn’t as subtle or introspective as “45 Years”, but that film was nevertheless lingering in the back of my mind as I watched Noah’s poignant yet manipulative film. Unlike the character in “45 Years”, Max cannot confront his spouse with the possibility of a past infidelity, which makes the character even more sad and helpless. Maybe this is an inevitable comparison for me, but I’d wager most viewers haven’t seen “45 Years” and can take in “Max Rose” free of that lingering comparison and replace it with the shadow of the iconic persona and reputation of the iconic actor that looms throughout the film. 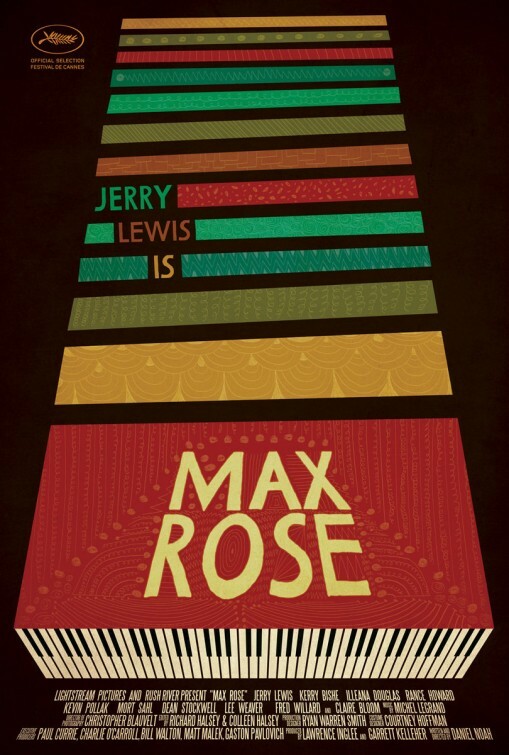 Lewis is obviously the reason to see “Max Rose”, whether or not you’re a fan. Call it curiosity. You can compare it to “Gran Torino”, when we thought that film would be Clint Eastwood’s swan song (then he fooled us with “Trouble with the Curve”), but at 90 years-old, it’s quite possible this could be it for Lewis. It’s fitting and poignant for him to go out on this note, playing a character who feels essentially himself. He’s an actor known for his slapstick comedic genius, yet here he’s showing a somber seriousness that exudes pathos and pain. It shouldn’t come as any surprise really, since many already know that if an actor can effortlessly master comedy, than they are likely to excel in dramatic roles. 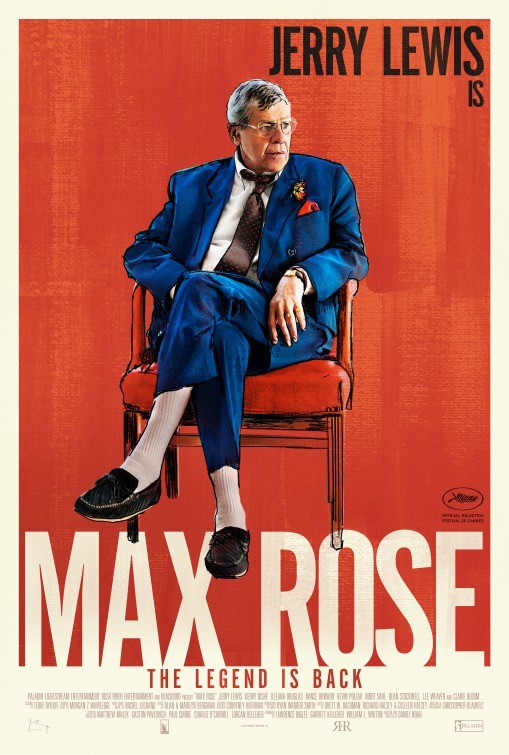 “Max Rose” was finished three years ago, when Lewis was 87-years-old and it even screened at Cannes that year. That must’ve been an amazing experience huge for Noah, who loosely based the story off his own grandfather. When I look at the premise, it intrigues me (but I must say, it’s one that was better executed by Haigh) and I feel like overall there are moments in Noah’s movie that work really well. It’s just not because of Lewis, but rather due to scenes or sequences he is in with others. Lewis is more of a presence here than he is an actor and that could be due to his reputation or just simply his age. Ordinarily, that wouldn’t be a problem for me. 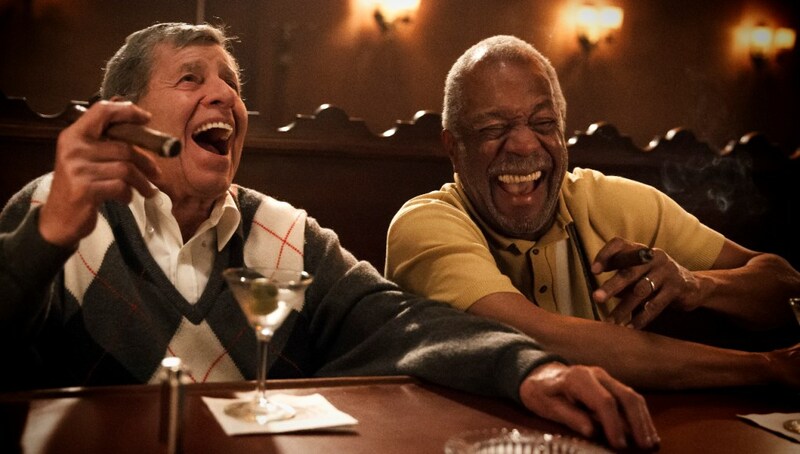 You wants actors to lose themselves to the material and disappear into the role, but here it was hard to determine what was going on with Lewis. Were his recycled mannerisms – staring off into space, glaring at someone like they have three eyes or repeatedly smacking his lips in annoyance – conscience decisions or basically what his aged self can offer at this point. I don’t know, but it wore me down. It felt like during the select great moments between Lewis and Bishé or Pollack found Lewis’ costars doing all the heavy lifting. There’s an emotional scene in Max’s nursing home room, where Pollack’s frustrated Chris confronts him, saying, “I love you” and when the camera rests on Lewis it looks as if the actor is somewhere else, leaving a more than willing Pollack to do the emotional lifting. 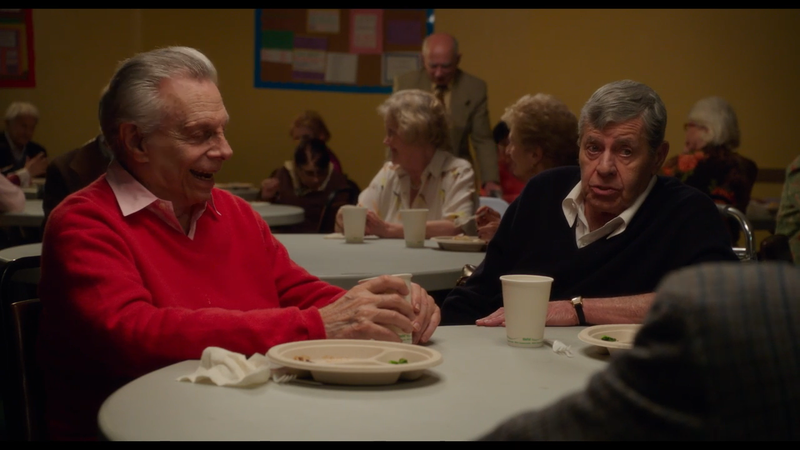 I hate that I noticed these things and that it bugged me, since I’m always yearning for movies to focus on the elderly more and embrace aged actors, but it’s hard not to be taken out of the scene in these instances. Through much of the movie, Lewis felt like a participant, rather than an involved presence. This changes once Max is transferred to a senior home, where he meets some peers (after a quick, unnecessary scene with the facility’s coordinator, played by Illeana Douglas) and we find Lewis finally coming out of his catatonic state, showing signs of not just Lewis, but life. The scenes with Lewis sitting around the dinner table or relaxing at his new friend Lee’s (Lee Weaver) quarters (a character who tells Max he used to be a celebrity, a huge TV star and had his own show – Bill Cosby perhaps? Hmmm…) with a couple other retiree cronies, played by Rance Howard (father of Clint and Ron) and Mort Sahl (a comedian from the 60s, who hadn’t acted in a film since 1984). These guys have a particularly great scene where they all riff off each other as they listen to an old jazz tune, with Lewis standing up and bee-bopping a killer air trombone. It’s a needed scene that allows these characters to enjoy each other’s company, enjoy life – but more importantly, it proves that Lewis can still cut loose with the pantomime improv. The movie reverts back into its somber mood though during its final act, where we see Max confront a pivotal character, an ailing Hollywood mogul, played by Dean Stockwell. It’s a melodramatic sudsy scene focusing on two bitter and confused old man as well as something of a catharsis for Max, where the truth does indeed set him free. Stockwell is great here, delivering his lines with such a tired exhalation of life that fit the regretful character, who’s surrounded by wealth and a mantle of awards that mean nothing to him now. However, it’s another instance where the costar overshadows Lewis. Essentially, “Max Rose” has some nice moments, especially when Noah has Max flashing back to tender moment’s with Bloom’s Eva, his darling wife, but as a whole, there’s something about Lewis’s overall performance that just didn’t buy. It could be because it’s hard to separate “The Legend” with the actor and while I definitely couldn’t take my eyes off him, much of that time was spent trying to figure out what Lewis was doing.